It's only about a week until all of the neighborhood children transform themselves into witches, goblins, and probably Star Wars characters and the occasional mini-Donald Trump, and descend upon our doorsteps to dare us to "trick or treat!" With this time-honored tradition comes concerns about trick-or-treating safety, and if you are a parent of a child who is Celiac or has gluten sensitivity, you have the added challenge of what exactly can they eat from their trick-or-treating haul? On Halloween, it's all about the candy, right? The good news is that many mainstream candies that are likely to be doled out at Halloween are actually gluten-free. Celiac.org has put out an updated list for October 2015 of the latest U.S. gluten-free candies, plus a handy 'Company Allergy-free Key'. Stay one step ahead of the inevitable question, "Hey mom, what can I eat?" by checking this list of gluten-free candies likely to end up in your child's trick-or-treat bag this season. Reminder that this list is a guideline and it's best to double check the packaging information and ingredients list prior to consuming any candy, even if it is on the list. 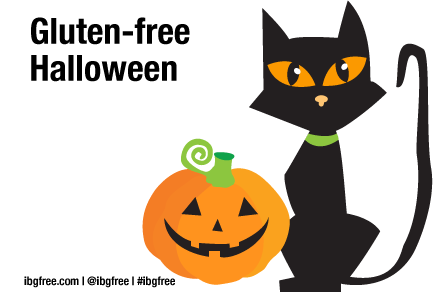 Buy a secret stash of gluten-free candy that you know your child likes, so you can broker a trade with any non-g-free treat they may have received on Halloween night. It's a great way to deflect disappointment about any candy they received that they cannot eat. Feeling more creative than that? Try your hand at making your own secret stash of g-free candy to surprise your child with for a trade. This gluten-free caramel corn recipe is easy and delicious and will make you nominee for Mom of the Year. Plus, it is easy to freeze so you can make it in advance. I am working my way up to attempting the homemade candy corn and the homemade toffee bars, the latter of which, let's be honest, is mostly for me and will likely never make it to the trading floor. Take some of the emphasis off of trick or treating by planning and throwing your own Halloween shindig. You can prep the menu to be chockfull of g-free goodies ("severed finger" cheese sticks are always a hit), and you can enlist the kids to help make scary decorations or plan games to play. (Be sure to have your camera ready for the Donut Chomp!) Include a costume parade and contest to help redirect the focus from the candy to the costumes or buy some extra pumpkins and host a pumpkin decorating contest. Prizes, of course, can include g-free candies or desserts or even a Halloween gift bag stocked with inexpensive toys. In 2014, Food Allergy Research and Education (FARE) launched their Teal Pumpkin Project to raise awareness of food allergies and promote inclusion of all trick-or-treaters at Halloween. You've likely already seen teal pumpkins showing up around your neighborhood or being posted to social media—they represent families who are advocating for a safer, happier, more inclusive Halloween by providing non-food items for trick or treaters, such as Halloween-themed pencils, spider rings, glow sticks, bracelets, or stickers. This year, show your support of children with food allergies and take the pledge to join 100,000 households who are participating in the Teal Pumpkin Project. With a little extra preparation and diligence, you and your kids can enjoy this Halloween with little worry about getting tricked for a treat. Happy haunting! Taken for granted so often in this day and age is one’s ability to eat on the go. Options are all around us, from grab-and-go choices in your pantry, to fast food chains, to the snack aisle at your local gas station. Also taken for granted? That those on-the-go choices are good for us. Hint: they’re usually not. 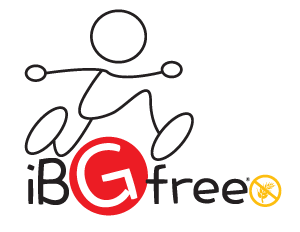 Enter iBGFree. 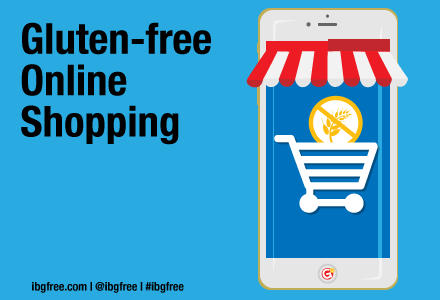 iBGFree serves the gluten-free community as a resource for healthy, convenient food and informative, fun content. 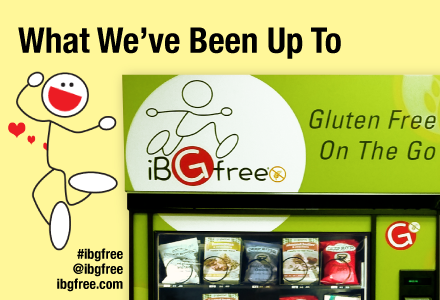 iBGFree was born out of the necessity for gluten-free, on-the-go snacks in venues where they traditionally do not exist. We provide fun, great-tasting, easy-to-access food for those living a gluten-free lifestyle. New iBGFree vending machines will be popping up within shopping centers, tourist destinations, entertainment venues – you name it. They might be situated next to a candy or movie dispenser, but what you’ll get from an iBGFree machine won’t be processed goop or the latest box-office smash. Instead, within iBGFree machines you’ll find health-focused, great-tasting options for those seeking a quick meal. Dispensed like candy bars or bags of chips, iBGFree machines ensure millions seeking healthy food choices will be able to have anytime, anywhere access to quality, individually packaged, gluten-free food and drink. 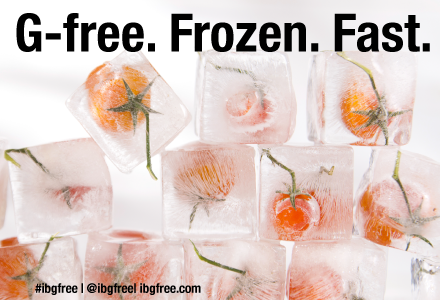 iBGFree is growing! We are thrilled to share that we currently have three up-and-running machines in Illinois, with additional expansion efforts in the works! So stay tuned...we hope to have one of our fabulous, brightly colored g-free vending machines available near you, very soon. 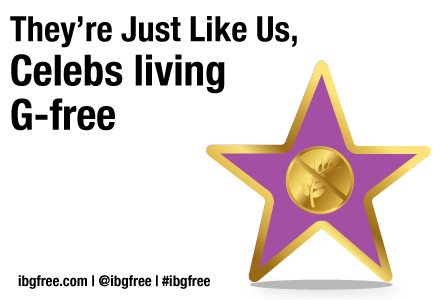 And, we are so delighted that our iBGFree community is growing as well. As we continue our mission to provide access to healthy gluten-free foods on the go, more than 2,000 followers have joined us on our journey! We are so glad that you are part of our g-free community. Stay tuned for more updates and helpful tips on living gluten-free. And be sure to keep up with us on Facebook, Pinterest, Twitter, Instagram and on ibgfree.com for even more exciting news and tips! On a Budget? You Can Still Go Gluten-Free! These days, it seems the price of everything is going way up, and a trip to the grocery store can bring the balance of your bank account (and your mood) way down. So, if you're like me, you spend a fair amount of time planning out your meals and your corresponding food budget each week in order to maximize your food dollars. And for those of us with the additional consideration of gluten intolerance or sensitivity, we need to make sure we are making smart purchases that don't break the bank. According to Money Talks News, the food industry is rapidly responding to the needs of those who are on a gluten-free diet, but g-free products can be breathtakingly expensive. One study found that gluten-free products, on average, cost 242 percent more than their wheat-based counterparts. There are legitimate expenses that help drive up the cost of creating gluten-free foods for consumers, first and foremost being the cost of having a dedicated, secure facility to manufacture g-free foods without the risk of cross-contamination from non-g-free ingredients. There's also the cost of specialty ingredients, employee training, and product testing and certification. 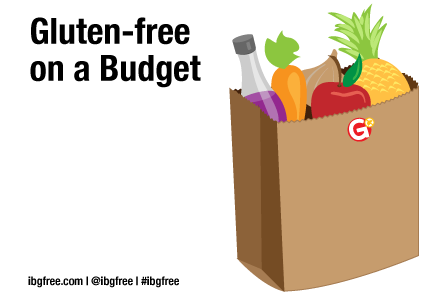 So, keeping a gluten-free shopping trip within budget is easier said than done, right? Well, not necessarily! Several spending-savvy members of our g-free community are here to help guide us through shopping g-free without ending up in the poor house. Go big or go home! Invest in bulk size whole grains like quinoa, millet, amaranth, buckwheat, and wild rice. You'll save when you super size vs purchasing in smaller quantities. Or ask your grocer about getting a discount if you buy pasta a case at a time. Once you buy in bulk, be sure to cook in bulk. Saving and freezing leftovers for future meals can save time and money. Like to shop online? Try buying in bulk at Amazon. DIY to the rescue! Skip the hefty price tags associated with buying pre-packaged mixes and flour blends, and make your own. It will literally save you thousands of dollars over time. Stop relying on processed gluten-free foods to make up your daily meals. Experiment with making your own broth rather than buying expensive gluten-free broths. Go ahead and get fresh! Eat in-season fresh produce or scour the frozen food aisles for sales (make sure those products are 100% gluten-free, of course!). Scout out your local farmer's market for seasonal inspiration. Eat lean to save green! Turn to lean meats such as fish and poultry and low-cost eggs for high protein (or plant-based proteins like beans lentils and for our g-free vegan friends). Use those specialty items to complement meals or as a special, occasional treat. You will soon see your grocery bill dwindle down. And if you snag a sale? Be sure to load up your freezer. The Gluten Free Goddess details her top 10 tips and recipe ideas for thriving on a g-free budget, including embracing the oh-so versatile potato—whether as a side dish or as the center of a meal—and pasta purchased in bulk. One of my favorite go-to recipes is the Roasted Veggie Smothered Baked Potato Recipe. So simple and yet so satisfying! Embrace these tips to ensure you are keeping your food budgets under control. Your pocketbook and your waistline will thank you! 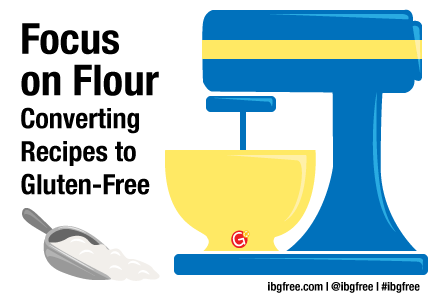 Converting Recipes to Gluten-Free: Focus on FLOUR! Some of the best recipes are the ones handed down from generation to generation, sometimes tweaked here and there, but largely sticking to the same tried and true formula that has bewitched and fattened up family members across the ages. Some recipes are so legendary, they begin to take a life of their own and make an appearance at each major holiday gathering, year after year. So, what can you do when you inherit a beloved family recipe and want to participate in the tradition, but aren't sure how to adapt it to be gluten-free, either for you or one of your g-free relatives? Or, what if you spot something fabulous on Pinterest and want to give it a whirl but need to make a few adjustments to ensure it is g-free? The good news is that you don't have to sacrifice your family legacy or deny yourself the giddy joy of trying that Pinterest recipe and contributing your Pinterest fail for the whole world to see. Yes, your horizons exist beyond gluten-free cookbooks! With a few strategic, yet very simple swap-outs, you can transform any recipe into gluten-free without giving up any of the appeal or flavor. By and large, the biggest conversion concern will be in baked goods (think, cookies, breads, and pies) and the biggest culprit will be the gluten flour. So, how do you convert a recipe from gluten flour to gluten-free? Well, the Gluten Free Goddess advises that for every one cup of all-purpose flour cited in a recipe, you can swap it out for 140 grams of your favorite gluten-free flour blend. Remember, every gluten-free flour has a different weight per cup. So, you'll want to buy a kitchen scale! Safe and popular g-free choices for baking can include sorghum flour, brown rice flour, white and sweet rice flour, millet flour, buckwheat flour, quinoa flour, certified gluten-free oat flour, and teff flour. 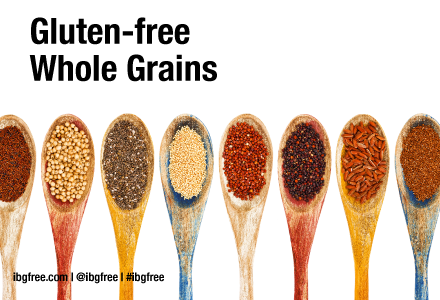 However, make sure sources of corn, millet, sorghum, etc flours are 100% gluten-free! Not to be outdone, almond flour, hazelnut flour, chestnut and peanut flours are high protein non-grain options. And do not count out legume flours such as chick pea flour and soy flour. The very trendy coconut flour is a high fiber addition to g-free blends that attracts moisture and adds a lot of texture and flavor. Less is more, and in some recipes this applies to the flour. For example, peanut butter cookie recipes do not suffer at all if you simply skip the flour. It's all about the blend. The Gluten Free Girl has a tried and true g-free flour blend that I have used for many baking recipes. This blend is free of any additives, preservatives, fillers, emulsifiers, xanthan or other gums. Bonus: for those with additional dietary or allergy concerns, it is dairy-free, egg-free, peanut-free, corn-free, soy-free, tree-nut-free, and of course, fish and shellfish-free. It’s also guaranteed to be free of cross-contamination from those ingredients. What's not to love? You can also skip the “DIY”, and find a nice flour blend from your local gluten-free Bakery, such as mine – Sweet Ali’s. King Arthur Flour provides an important key to unlocking the gluten-free conversion conundrum. Adding liquids (egg, water, milk) will increase hydration and develop structure, but keep in mind that they may also promote a cake-like texture. Using fruit purées in place of some of the liquid content can help aid in building structure. So, with that, I hope you will be inspired to dig through your dog-eared cookbooks for those traditional family recipes you're hoping to try! With a few savvy swaps, you will be on your way to creating timeless new recipes and family memories to pass down to future generations. I don't know about you, but I felt a little chill in the air this morning... Fall is just around the corner and with it the turning of the leaves, the smell of cinnamon and spices, and yes, pumpkins! We are heading into one of my favorite times of the year! I'm talking about the triumphant return of the fall season and the inevitable hoopla surrounding apple festivals and trips to the pumpkin patch. Not to mention our national obsession with a certain warm, frothy beverage. #PSL, forever! Okay, technically it's still summer and the official start to fall is a few weeks away. But, here in the Midwest, the leaves have started to get that yellow tint to them and already my Pinterest boards are filling up with pumpkin-infused everything. So, it got me inspired to get my culinary act together and share some of my favorite fall-friendly, gluten-free recipes. And it's all about the pumpkin, people. Rich in Vitamin A in the form of beta carotene, pumpkin is also a good source of heart-healthy potassium and folate. So, it totally rocks that it is a popular staple in many gluten-free recipes, from smoothies to bread to brownies. Cinnamon, ginger, nutmeg, cloves, and allspice create such a perfect spiceland utopia in this smoothie that you will be questioning where it has been all your life. Seriously, whip this one up for breakfast or a fun fall snack (or for lunch or dinner—there's no judgment here). Just be certain that all of your spices are gluten free! Betty Crocker got it so right with this recipe. The convenience of using their gluten-free yellow cake mix and canned pumpkin does nothing to diminish the excellence of this fall favorite. The folks at Faithfully Gluten-Free have been faithfully trying to destroy both my waistline and willpower with this beautifully decadent dessert. The pecans and dulce de leche make the perfect unexpected accompaniment to this gluten-free masterpiece. If you're like me, you've probably already been to the apple orchard twice this season and are scratching your head at that bushel of apples stashed in your kitchen corner, wondering what in the world will become of them. This recipe is their destiny. Figs or dates can be handily swapped in as the main fruit in this recipe, if you are not yet suffering from an abundance of apples. Forget baseball or the Kardashians as the nation's pastime/obsession. A few years ago, America discovered the wonder that is the pumpkin spice latte, and our nation was forever transformed. Well, most of the nation. Gluten-sensitive and Celiac consumers have been trying to answer the question, "Is Starbucks pumpkin spice latte gluten-free or not?" since it first appeared on the Starbucks menu, with concerns about potential gluten in the syrups and the very real risk of cross contamination from the baristas brewing non-gluten-free beverages on shared equipment. On August 17, 2015, Starbucks announced they were revising their ingredients list to add real pumpkin and remove the caramel coloring. So, the jury is still out on whether we are (gluten) free to be part of this fall obsession. I say, simply save yourself the worry (not to mention a few bucks) and try one of these delicious gluten-free pumpkin spice latte recipes at home! For this recipe, it felt very luxurious to buy the Godiva Pumpkin Spice coffee. Go ahead and splurge! I love the addition of the agave nectar in this recipe, and swirling the cinnamon stick around in the delicious foam makes me feel like an adult. With that, I will sign off so you can head out to the grocery store, stock up on pumpkin (real or canned--again, no judgment), and raid the spice aisle at Whole Foods. 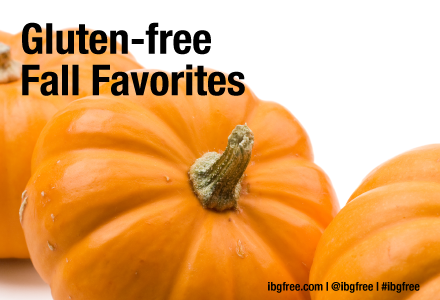 What is your favorite gluten-free, fall-friendly, pumpkin-inspired recipe? Drop us a note in the comments section! Online shopping is the wave of the present, and future. Shoot, between eBay, Amazon and their peers, as well as food delivery services like Schwan’s and Peapod, a person could almost never leave their house to complete all their shopping! This handy site splits foods up into categories, and lets you know where you can go to order them. Snacks, meals, you name it, they have this site so categorized you’d have to try to miss something. And it’s very thorough – much of America is represented here. They even have beer, lots of beer! This website functions somewhat as a top-ten list of sites at which to purchase gluten-free food for delivery. Some big names appear here: Amazon of course, but also niche offerings like Allergy Free Kosher and others. This is a definite bookmark! This is a little bit different, and a really cool idea. Here we have a monthly subscription service that introduces you to new gluten free products – similar to more well-known services like Birchbox (makeup products), Stitch Fix (clothes) and BarkBox (probably self-explanatory!) And not only does it just introduce you to new gluten-free stuff, it’s feedback-based – so you can receive discounts, etc. How cool are these ideas?! Now, I wouldn’t recommend being a shut-in, but winter is somehow approaching quickly… This could be just what we need! I wish I were so lucky. I’m talking about those fortunate folks out there who get the summers off! Oh to be a kid again, when June, July and August were light and carefree. If you happen to be a gluten-free teacher, or maybe a snowplow driver, listen up because this blog concerns you! Let me set the scenario: As the leaves prepare to turn, you prepare to head back to the daily grind of your workplace. There are meetings to be had, paperwork to be done, deadlines to meet – but what about that other obstacle you haven’t had to deal with since late spring? 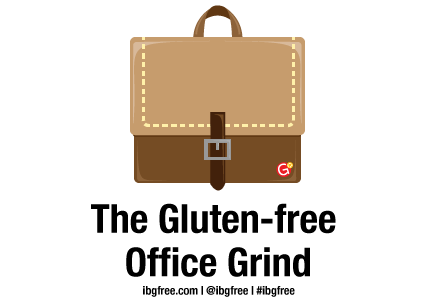 That’s right, I’m talking about making your gluten-free lifestyle mesh with a decidedly gluten-heavy office. Stock up on your own gluten-free snacks and keep them protected – to avoid cross contamination yes, but also to avoid poaching! They can be tasty, too! Now, the potentially awkward: What if you are a sufferer of celiac disease or gluten allergies but have a co-worker (or multiple co-workers) who are on a gluten-free diet, not due to celiac's or gluten intolerance? It may go a little something like this. Joking aside, first, you could inform them about celiac disease (whether you have it or not), just to give them some perspective on the very real roots of gluten-free living. Additionally, explain cross contamination to them – that, paired with some celiac facts, could help change their thinking about not only your diet, but their own. Every little bit could make life easier for you! Below are some expanded tips on the above ideas, as well as suggestions for at-work breakfasts, lunches and snacks. Happy working, and remember – June is only 10 months away! Back-to-school time – it’s always a mad dash, isn’t it?! There are clothes to buy, teachers to meet, pencil boxes to fill and bus routes to memorize. It can be an exciting time, yes, but stressful as well. Potentially adding to that stress, whether you’re a parent, a kindergartner or a seasoned Senior, is the integration of a gluten-free diet into the at-school life. But hey, what am I here for, if not to try and impart some wisdom to calm those new school year fears?! A great baseline not all of us might know about is something called the Section 504 plan. The Section 504 plan, meant to deter discrimination against those with disabilities, requires a school to provide gluten-free students with appropriate lunchtime meals. Clearly, this is a great place to start if you or your child suffers from Celiac disease. Fill one out, share it with your school’s administration and start the year off with some peace of mind. For the rest of us gluten-free folks, Celiac or not, there are universal things we can all stick to. Help your child prepare a “Yes I’m gluten free, and here’s what that means” elevator speech if you deem it necessary, just to help thwart some awkwardness that’s sure to arise. Making sure before they leave your care for the schoolyard that they have a good grasp on what foods are off limits is a must, as is getting together a list of whom to go to at school if they run into an issue. In that same vein, meet with your child’s teachers, principals, nurses, etc. prior to the start of school to share information about his or her dietary needs. Lastly, make it fun! Perhaps giving your child’s teacher a gluten-free “goodie bag” to stow away in the classroom would spice things up a bit, and give him or her a taste of home while away from its comfort. 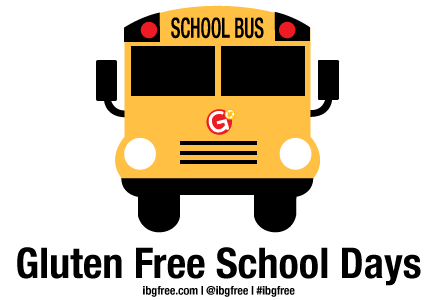 The tips, tricks and tried-and-true methods surrounding a gluten-free back-to-school effort are so many, it’s going to take five links to completely fill you in! Read up and make this school year the best – and most gluten-free – one yet! August has arrived, and with it have come back-to-school thoughts for college-age students across the country. Now, a lot of us have been to college, and that same “lot” know it can entail more than just class. However, maintaining a good GPA and good health, especially for gluten-free students, is very realistic! I’m not certain that paste is even gluten free! Keep your gluten-free utensils close to the vest – see above! These ideas are just scratching the surface of being successful in a gluten-free college environment. Here and here are a couple blogs that can expound upon what I’ve just shared. In addition, here is a blog that houses some very valuable tips about the gluten-free college experience, written by g-free college kids, themselves. And hey, a top-10 list of the most gluten-free friendly universities could come in handy, right? Here it is! May your (or your scholar’s) secondary education experience be gluten-free and devoid of cross contamination (as well as paste!). We’ve probably all been there: You spend a summer day at the pool, and then at baseball practice, and then finally you’re home with showers taken and stomachs empty. Such is a byproduct of busy summertime. The last thing any of us typically want to do after a long, hot day is slave over an equally hot stove, when all that sounds good are quick eats and cool sheets. Throw in the need for gluten-free products and, oh boy, you can have a dilemma on your hands! Thanks to modern technology, though, frozen meals can be a perfect fit for such an evening. Doubly good for the gluten-free crowd, is that we are really starting to see an increase in the amount of freezer meals that we can quickly pop into the microwave or oven. These meals are safe for us to eat, and delicious too! Chicken nuggets… Corndogs… Pizza… Soups… All these are current gluten-free options that are available to us in frozen form, and they are made by several brands – perfect fare for those summer days, no? And most of us have heard about Udi’s; they have an entire page of frozen meals on their website, and a feature that lets you see what stores close to you carry certain meals. And how about this for an idea: the Gluten Free Mall. At this site, you can order from a plethora of frozen, gluten-free meals online, and have them shipped to your door. How’s that for convenience? We all get busy, and summer can be the busiest time of all. Take heart, though, in the above words and the below links. Take control of your summer, and fill your belly with gluten-free goodness while you do it! Have you ever been waiting in the checkout aisle of your local grocery (cart stuffed full of gluten-free goodies, of course), and been just bored enough to page through one of those Us Weekly magazines? You know, the ones with the Jenners and/or Kardashians on the cover every time? Anyway, those magazines have a feature called “They’re Just like us!” – this recurring section includes photos of various celebrities doing mundane, peasant-type (wink, wink!) tasks such as getting gas, receiving a parking ticket or leaving a store with a torn, overflowing bag. It turns out, though, that a lot of the people in those photos really do have something in common with us: a bunch of them are gluten-free! Just for kicks, here’s a list of some notable names who steer clear of gluten-laced goods. Enjoy! · Oprah – We’ll start with a big name, if not one that is truly gluten free. The talk show billionaire followed a strict diet during a recent three-week cleanse in which she gave up, among other things, gluten. · Jennifer Aniston – This ageless star recently dabbled in the short-lived “baby food” weight loss plan that consists of small jars of pureed, gluten-free vegetables and fruits. Let’s hope she stayed away from the jars of peas – yuck! · Russell Crowe – The Australian superstar shared on social media last month that he’d dropped nearly 20 pounds of fat, and gave credit to a gluten-free diet. Did he gain weight for a role we don’t yet know about? · Zooey Deschanel – Known mostly for New Girl and her role opposite Will Ferrell in Elf, this dead ringer for singer Katy Perry was once vegan and gluten free. She’s since ditched the vegan lifestyle, but still ingests no gluten due to an allergy. · Jim Carrey – This megastar swears by a "veggies and protein" diet, and steers clear of wheat and dairy – most of the time. He admitted recently to cheating and getting a pizza from time to time. Can we hold that against a guy that funny? · Chelsea Clinton – The only daughter of the political mega-couple has a gluten allergy, and is a vegetarian, as well. She even had her nuptials and reception catered entirely with vegetarian and gluten-free dishes, including the wedding cake! · Drew Brees – Super Bowl winner? Check. NFL Man of the Year and Comeback Player of the Year? Check and check. Gluten free? Check. The star quarterback of the New Orleans Saints suffers from Celiac disease, but you wouldn’t know it by his on-field performance. · Miley Cyrus – Say what you want about the pop singer’s other lifestyle choices, but something is working to help her keep her shape. She tweeted earlier this year that her gluten-free choice was not about weight, but about health. We’ll ride a wrecking ball to that! Those eight names are only the beginning of a huge list! 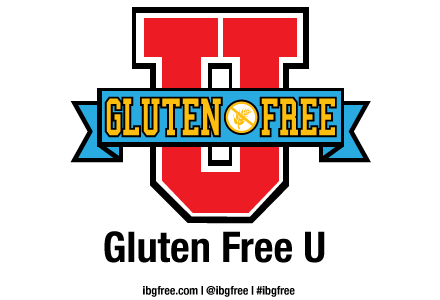 Want to know more of the names, and the stories behind their gluten-free choices? Check out the links below! As we gluten-free individuals know, despite all the cool restaurants and recipes and tips and tricks that are available to us, it can be easy to get into a dietary rut. I don’t know about you all, but my ruts tend to revolve around the same rotation of foods, prepared the same way, week after week. With our busy schedules, I suppose it’s human nature to err on the side of comfort and convenience, rather than keeping things mixed up with only a little extra effort. As it turns out, those “rut” or “go-to” foods aren’t always the best nutritional choices for us, and we could probably be preparing these healthier gluten-free meals in a more efficient manner, as well. The great news is, both of these problems can be solved a lot more easily than we might think! · Find the whole grains! As you browse your local market for gluten-free goods, search the labels for the first ingredient listed. Bread, cereal, pasta and the like that are largely made from wild rice, brown rice, buckwheat, whole corn and other whole grains are more nutritious than refined grains. · Always go with enriched. Only select gluten-free brands enrich their products, but your body will know - and appreciate - the difference. Pro tip: B vitamins like thiamin, riboflavin and folic acid will appear on enriched foods' labels. · It's simple to cook whole grains! Much like rice, the finished product looks a lot more complicated than the process required to make it, actually is. Think of it like this: dry grain + pan + water / broth ... Boil ... Simmer until liquid is absorbed. Easy, right?! · Remember how your dad never used the instructions when he built your toys? Cooking grains is a lot like that! Cooking times can vary according to taste. If you like your pasta a little bit al dente style, then shorten up that cooking time. Want those whole grains tender? Add more liquid and keep cooking until it feels right to you. You are in control! Some of these things may seem like common sense, but you may be surprised at how many of us don't step out of our meal routines for fear of the unknown. As you saw above, it doesn't have to be that way! Have more questions about how to healthily spice up your gluten-free menu at home? Check out these links!